The Legacy features a large refined interior with leather seats, eight-way power adjustable seats for the front driver and passengers, and high-quality soft-touch materials. The standard Harmon Kardon® audio system takes centre stage with a powerful 11 speaker set-up, subwoofer and amplifier. Voice-activated climate control lets you adjust fan and temperature settings without lifting a finger. 506ℓ of boot space enhances your adventures. Use today's most popular apps with Apple CarPlay™ and Android Auto™. Voice recognition capabilities allow hands-free use, keeping everybody safe while reducing distractions when you're on the road. The available AM/FM/CD/MP3/WMA infotainment system features an 8" high-resolution multi-gesture capacitive touchscreen. This system incorporates Bluetooth mobile phone connectivity and streaming audio, dual USB ports/iPod control, auxiliary audio input and steering wheel integrated controls. The standard power sliding sunroof with sun shade cover keeps you cool in summer and warm in winter. With capability in its DNA, the Legacy is ready to take you farther than ever before. 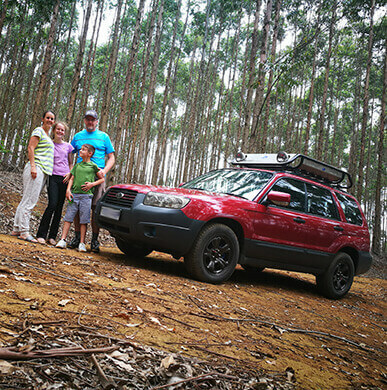 Few other cars drive with the level of confidence and responsiveness of the Legacy, and the main reason for this lies beneath the surface – the Subaru Boxer engine. Combined with Symmetrical All-Wheel Drive (SAWD), the responsive steering of the Legacy gets you to your destination in comfort and in peace, while sharing the fun with your fellow adventurers. With Symmetrical All-Wheel Drive (SAWD), you have the confidence to drive in wet and dry conditions, and on any terrain. The Legacy is the only car in its segment with SAWD for added safety and off-road capability. 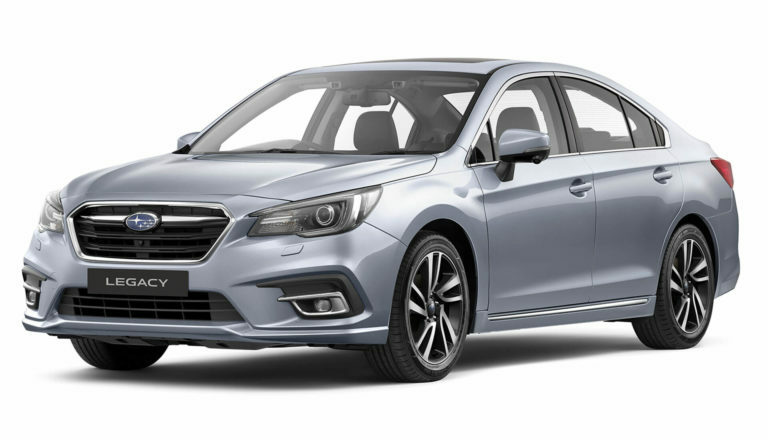 A world-class all-wheel drive system, striking agility, standard Vehicle Dynamics Control with Active Torque Vectoring, ABS, superior visibility and a low centre of gravity give the Subaru Legacy the tools needed to be an active safety superstar. Then, next-generation thinking in the form of the EyeSight advanced driver assist system elevates active safety and accident avoidance to entirely new levels. If EyeSight senses an impending collision, a buzzer and a light on the dashboard warn you. If you don’t take evasive action, the system can automatically apply the brakes and reduce engine power – either preventing the collision entirely, or reducing the severity, depending on your speed. If you apply the brakes, but not hard enough, EyeSight applies more braking force to stop the vehicle. EyeSight Lane Sway & Departure Warning both activate a chime sound when your vehicle begins to drift or is too close to another lane. Should EyeSight detect an obstacle in front of you while you are parked, and you put the vehicle in drive instead of reverse, you’ll hear several short beeps, see a flashing indicator and the engine will reduce power to help you avoid a collision. In the event of a head-on collision, the Subaru Boxer engine and transmission are designed to absorb impact, and then break away from the vehicle structure and drop below the passenger cabin, for added protection. A total of seven airbags standard gives you peace of mind. Subaru Rear Vehicle Detection features Blind Spot Monitoring, Lane Change Assist and Rear Cross Traffic Alert. It monitors rear blind spots for danger, makes lane changes safer and can also warn you of a potential collision. For example, when your reverse into a street with passing traffic. Equipped standard with front, side and reverse cameras to ensure you have optimal visibility when parking and manoeuvring around pavements, pedestrians and other vehicles.